Wontons, Pot-Stickers, Dumplings, teeny weeny hand bags…..call ’em what you will, but these little beauties are incredibly addictive. The only trade off here is the making which takes a bit of time, effort and a degree of dexterity..but don’t let that put you off once you get the hang of dumpling wrapping it becomes dead easy. Dumplings or Wontons are simply just stuffed pastry – really, really thin pastry. They can be stuffed with anything you can think of, prawn, beef, pork, duck or in this case a mix of chicken and prawn…I’d stay away from custard and asparagus though…..
Start by defrosting the wrappers, separate 20 then whack the rest back in the freezer. There is nothing worse in this world than leaving them out, forgetting about them and trying to separate goop with a needle next time you need them…..believe me….I know!! Mix all of the dumpling ingredients in a blitzer until pasted, at this stage you can take a small piece, drop in some boiling water and test for seasoning. To get the wrappers rolling wet the edges a little and dump a teaspoon of the dumpling mix right in the centre. Gather up the edges and squeeze together to form what looks like a little purse, twist and press down to seal. Do this with all of the wrappers and make sure you set the finished dumplings on grease proof paper or they will stick to everything…….a bit like the great dumpling sticking tragedy of ’84. When you’re ready to start cooking bring about 800mls of good chicken stock to a rolling simmer then plonk the dumplings in, poach for roughly 5 minutes. After this cooking time pull one out and cut through it to double check the stuffing is completely cooked. 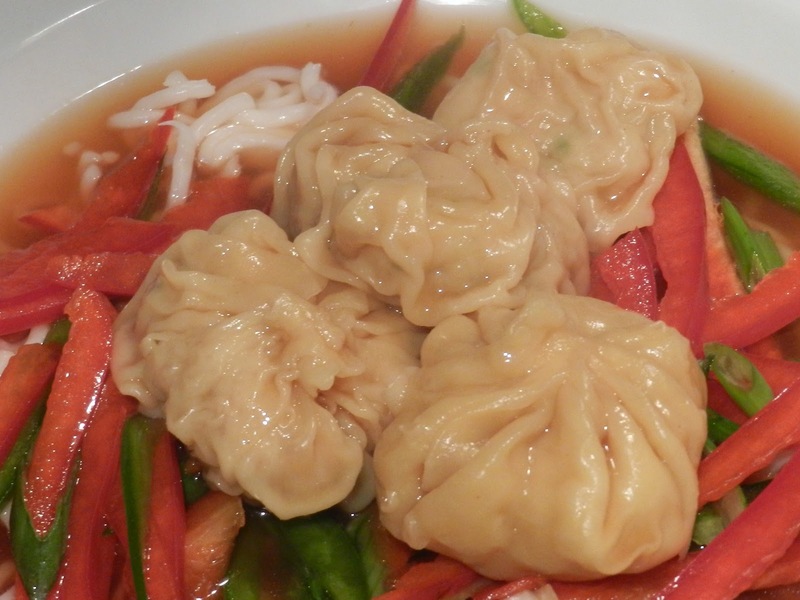 To serve, arrange pre-cooked noodles and raw sliced veg in a large bowl then ladle over the dumplings and the broth. Important note here, give up the chop sticks for a dish like this, dumplings are slippy and unless you want to loose most of them down behind your sofa I advise using a huge spoon!